Light up the Night Christmas Parade and Tree Lighting Ceremony. 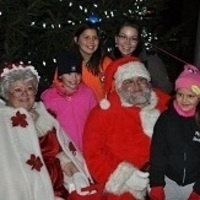 The City of Dunbar celebrates the holidays with a night parade throughout the city featuring marching bands, vehicles decorated for the holidays, floats and a sleigh carrying 'Jolly Old St. Nick'. The parade route will begin at the Dunbar Bridge and travel north on 10th Street, West on Dunbar Avenue, South on 16th Street and East on Myers Avenue. The parade will halt at City Hall, 12th Street and Myers Avenue, so that Santa and friends can drink hot chocolate and sing carols while lighting the town's Christmas Tree.